You have to right to remain petting me. You have the right to give me treats. If you can not afford one, I will not play dead. It's tough to have a dog with a career. When you brought Fido home as a puppy you thought he'd spend most of his time chewing bones and begging for walkies. How were you supposed to know that he had a calling? Well, it's not all bad. When you walk past the donut shop he usually hooks you up with a free one. And you're not sure if this happens with all dogs but the bank is always sending a couple treats through. Hmm, that might be because he's such a good boy! This costume represents Fido's love for the force. It's easy to put on and the simple design won't get in the way of all his important official business (we hear the dreaded mailman is at it again). The car shaped tunic straps on across the belly. It also comes with the realistic looking Police hat that straps on to the head with an elastic band. When your dog is a guard dog they should look the part. 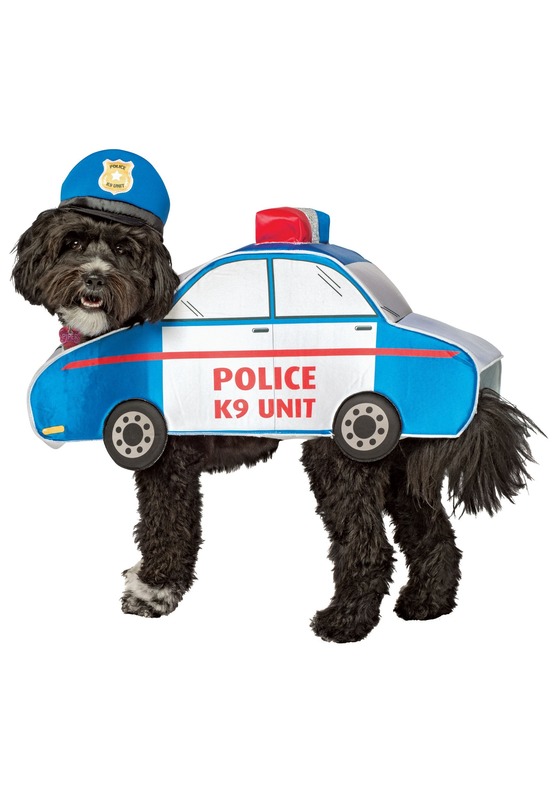 if any criminals come around the house, they'll back off when they see Fido sniffing around! So, strap Fido in and get out your remote control car. It's time to have a car chase in your very own backyard!